Looks and sounds delicious Jean! I love sourdough bread and your pizza pan looks interesting. I have a pizza stone and several individual size cast iron pans I use depending on what I'm in the mood for or whether we have company. 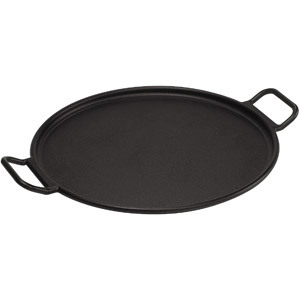 My stone is slightly cracked (12 years of weekly use) so I might be in the market for another one—or this pan. Your sourdough looks divine! Richard, thank you! You should definitely give this pan a try before you buy another stone. You know, I really should be making pizza more often. I might have to adopt your family tradition of a weekly pizza night! Boy, if I could eat wheat, I would definitely give this a try! I really miss 'real' bread. It looks amazing, Jean. Thanks, Judy! And, not to worry -- I'll eventually get around to a GF version. You read my mind, Jean! 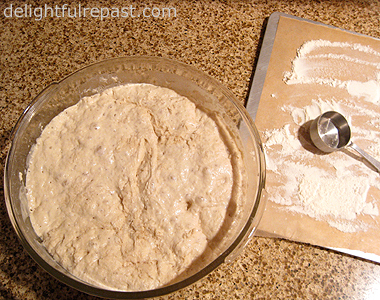 I was just talking with a co-worker about finding that sourdough starter recipe--and Voila`--there you have it. Thanks! I'm sending it on to her and I will make a batch myself! Jean I have just clicked on my reading list to find my link to your blog. When I click on the title of your blog , as you know, I am presented with a whole list of your recent posts and all your posts going back into the mists of time. It is a poetic experience to read them all. The imagery your titles conjure up is ,"delicious." A moving experience. Anyway, to the point. Sourdough bread;love it. Great eating experince. I absolutely hate the manufactured white bread you get on supermarket shelves. The only convenience bread Marilyn and I buy is whole grain bread. At least it's real bread to certain extent. Susan, thank you! I hope you both like it as much as we do. AND do tell ALL your co-workers, friends, relatives and mere acquaintances to read my blog!! Thanks, Tony! I'm flattered to have such a good writer and photographer as you reading my blog. 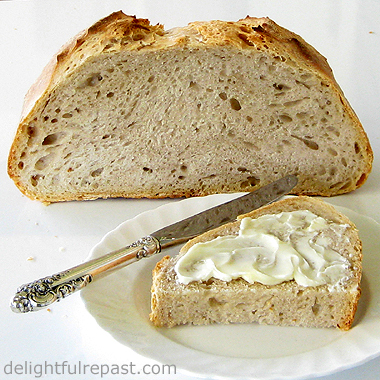 Whole grain bread is our everyday bread, but homemade white breads, including sourdough, are an occasional treat. 72 hours? I could forget my name, where I live, and what my mother looked like in 72 hours! Put that much time between my first craving for sourdough and seeing that amorphous mass on my cutting board and I’d probably scream “Wazzat?” and beat it with a flyswatter. This is why I gave up being a chemical engineer – too impatient to wait for the Big Bang. On the other hand, your sourdough (particularly slathered with butter) looks like it could make the cut for exceptions to my no-bread habit. Delicious looking…and sounding, Jeani! Well, that's quite an endorsement, coming from you! Wish I had a no-bread habit - as you know, I am a breadaholic (which was fine until I became a woman of a certain age)! Greg, it's a must - there could be three main dishes and seven sides on the table and my dad wouldn't consider it a meal if there was no bread on the table! lol Jean, didn't you just comment on my blog recently that you need to cut back on the bread. Then I come here and find this delightful looking loaf! I never made sourdough yet. I want to make a starter but, sigh - it's finding the time for it all isn't it?! 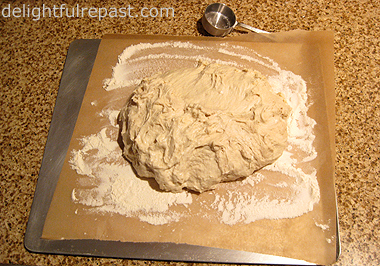 This looks so delicious and I've never actually made sourdough bread before!! Will definitely be trying this!! Thanks, Emanuelle. Let me know how it turns out for you. 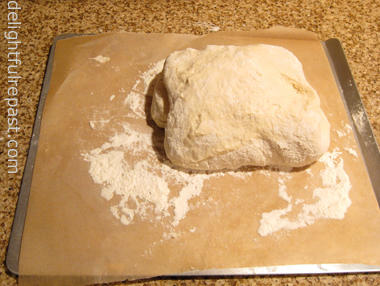 Looks like a gorgeous loaf of bread, Jean! I love sourdough... but have never made it myself. This looks like the recipe to try! Thanks for sharing. Thanks, Jenn. 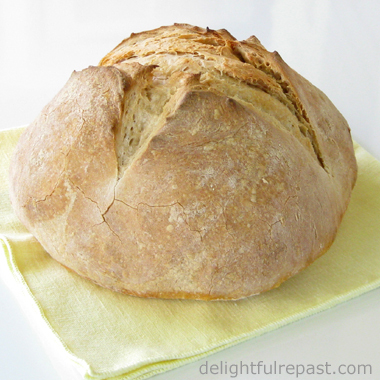 You won't find an easier recipe for sourdough bread! Let me know how it works for you. Jean, this is one fine artisan bread. 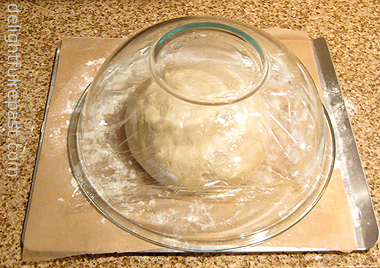 I am going to get a pan too as I bake bread so often..so practical. That's a wonderful compliment, Angie, coming from such a fine bread baker as yourself! Thanks, Trish! I hope you'll try it soon. And DO let me know how it turns out! I am new to baking and was wondering if any of you have ever used any starters from Sourdough's International.. I have a friend who loves it but I'm looking for some more opinions. Rachael, thank you. I don't have any experience with purchased starters. I've always thought if I were going to get one, I'd probably get one from King Arthur Flour. But the company you're looking at might be good too, I don't know. I don't make sourdough often enough to want to bother with maintaining a starter, which is why I came up with THIS method.